Smart, simple-to-use web based group messaging allows you easily send a voice or a text message to every phone number on your list. Your message will be delivered within minutes, to any group, large or small. Schools, congregations, sports teams, businesses and municipalities across the country rely on our solutions for emergency notifications and reminders. Our delivery system has capabilities to handle thousands of messages per minute, be it voice or text. Since our system utilizes the latest and greatest Ajax technology to give users "desktop application" feeling, there is no use of "back" / "forward" buttons in your browser. The whole application is being displayed as one, and only one web page. Please do not use back and forward browser buttons. The top menu functions (in the figure above) are always visible and available, regardless of the screen or form you are currently working on. 1) Right mouse click brings a small pop-up menu with functions (in the figure on the right) such as Add New, Delete, Edit, etc. This option gives you the quickest access to all of the functions. 4) Newest entries are always displayed at the top of the list, oldest ones - at the end. Before you send your first real broadcasting, you may want to review your Settings, such us Company Name, Phone, etc. Settings can be accessed from the top menu. For legal reasons you are obliged to provide your actual phone number; it will be used as the 'caller id' for all sms and/or voice messages you will be sending. The same goes for your email address - it will be used for all email broadcastings. The easiest way to send an sms (text) or TTS message is to use top-level function Send Quick Text Message located in the top menu. 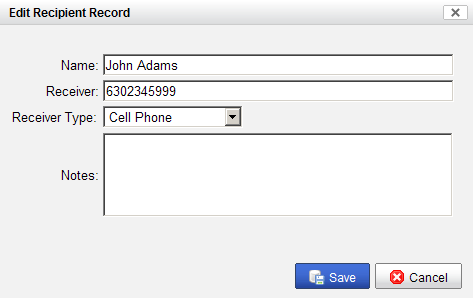 This functions allows to send a message to any ad-hoc phone number, it does not have to have a recipient record created. In case of the cell phone, an SMS will be sent; for land line phone, a Text-to-Speech (TTS) message will be sent. 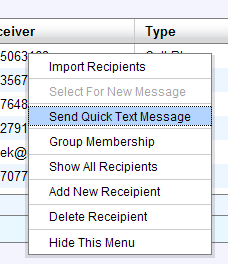 Quick Messages can only be entered in text format, which means they are limited to Cell Phones and Email Addresses. If Quick Message needs to be sent to the Landline Phone, Text-to-Speech engine will be automatically used, and text message will be delivered as voice. By selecting top-menu function from Functions/Quick Message, it is possible to send Quick Message (text or Text-to-Speech) to any ad-hoc receiver - you can just enter the phone number, without adding this receiver to the Receivers database, as in the example above. 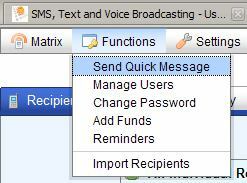 The easiest way to send a voice message, is to use recipient-level function Send Quick Voice Message. 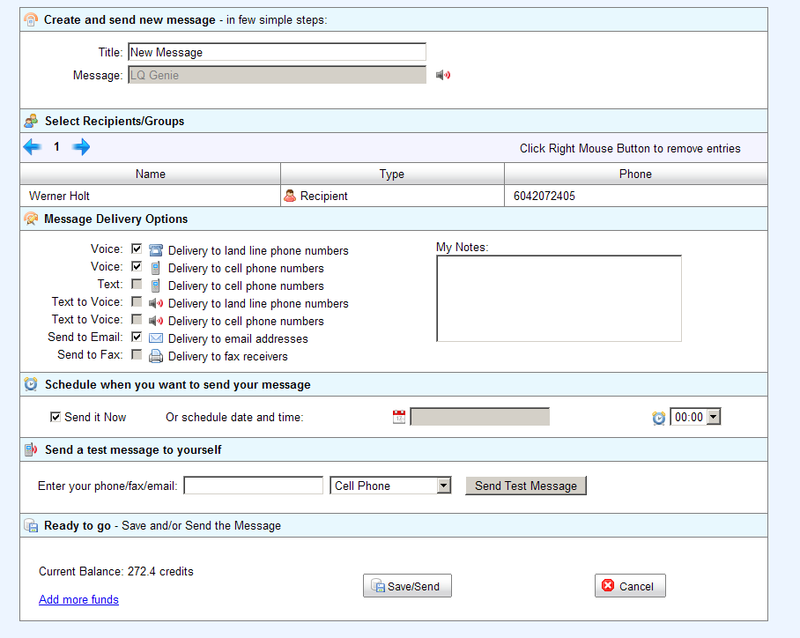 With your mouse over the recipient record, click the right mouse button and choose Send Quick Voice Message from the pop-up menu; once you have a new message form displayed, you will need to find (browse for) on your computer a pre-recorded voice file that you want to send. It could be any wave or mp3 file. Simply select the file, and click Send. To send voice message, you will need a voice (sound) file. There are two ways of creating a voice file: upload a file that you already have on your computer, e.g. 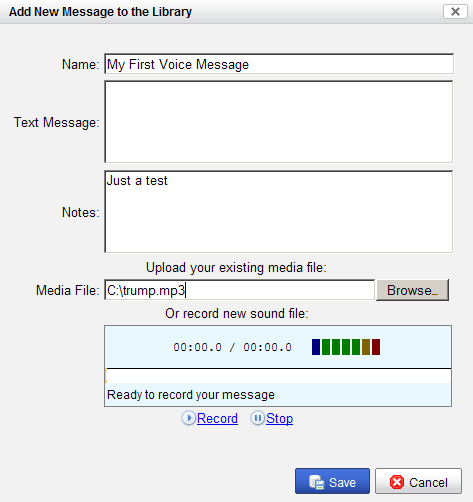 voice file that you previously recorded, or record a new file using built-in recorder. 2) Enter message's data (name, notes), choose a voice file and Save it; .mp3 and .wav files are supported. When editing new broadcast message, you can always switch to Recipients or Audio/Text Library tabs in order to select recipients (or groups) and pre-defined messages previously added to the library. You can select desired entry just be clicking on it with left mouse button. 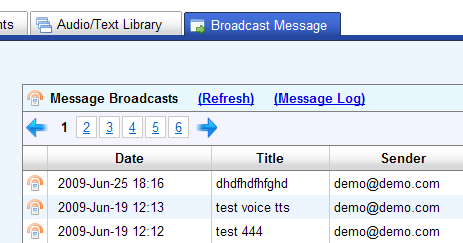 Multiple recipients can be added to one broadcast; only one pre-defined message from the library can be selected. The idea behind having the Audio/Text Library is that once it's created, it can be re-used (re-send) as many times as needed (e.g. if you need to send the same message every week). Each broadcast can be sent immediately ("Send it Now" checkbox), or it can be scheduled to be sent anytime within next week. 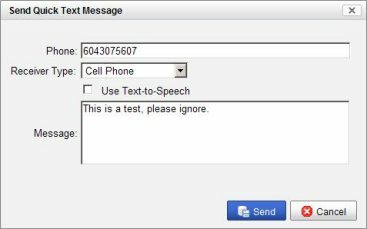 Before sending it, there is an option to send a test broadcast to your own receiver - "Send a test message to yourself" option; you may want to use it when sending high-volume messages to your customers, and you want to make sure it sounds right. Once saved (which means either sent or scheduled, the broadcast can not be changed. In case of scheduled broadcasts it can be only deleted. If you delete it before the scheduled time, it will be cancelled and nothing will be sent. The same way you send voice messages, also applies to text, fax and email broadcasts. When sending broadcast messages, you have freedom to select all kinds of recipients. Some of them may have cell phones, some of them land line phones or emails. "Message Delivery Options" give you ability to e.g. send text (sms) messages to the cell phones, and using our text-to-speech engine, convert your text to voice and deliver it to the land line phones. Our system will automatically, depending on the format of the message you are sending, propose delivery options that make sure you will reach maximum number of recipients. At least one delivery option needs to be selected. If selected delivery option does not match any of the selected recipients, no messages will be sent. Instead of entering all the recipient data manually, there is an option to import a list of recipients from CSV file. 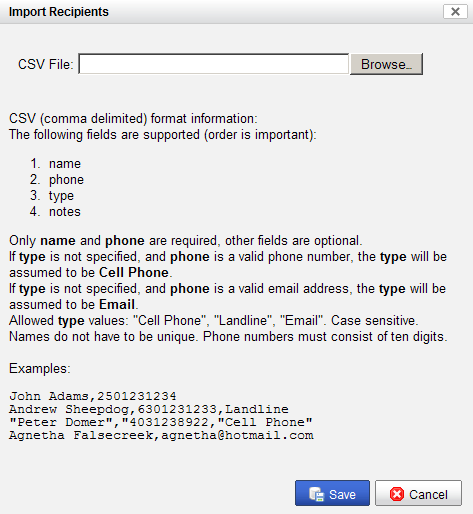 CSV files (comma delimited format) can be created using popular MS Excel or Open Office programs, any text editor, or exported from your customer database. Most of databases support this kind of format. With this option you will be able to add thousands of recipients in no time. If your database doesn't include customer names, but only phone numbers, a dummy recipient name can be used; recipient names do not have to be unique (but they can not be blank either). 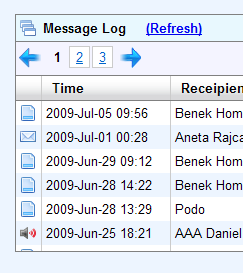 By selecting top-menu function Reports/Message Log you check on the current status of each message you've sent. Failed entries will be displayed in red color. You can click on each message in the report, to see the details. All date/time information is displayed according to your local timezone, assuming it is set correctly on your computer. Internally, date/time date is stored in PDT and is re-calculated based on your computer timezone settings before being displayed. The Settings panel (accessible from the top menu) allows users to enter their business information. Some of the settings are very important. The most important information from the point of view of message delivery, is your 10 digit phone number. It has to be your actual and valid phone number. The phone number may be used as caller id for all outgoing messages. It is illegal to use invalid or fake phone number for this purpose. 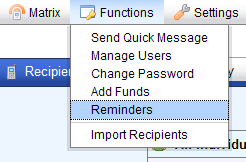 By selecting top-menu function Functions/Reminders it is possible to send Reminders. 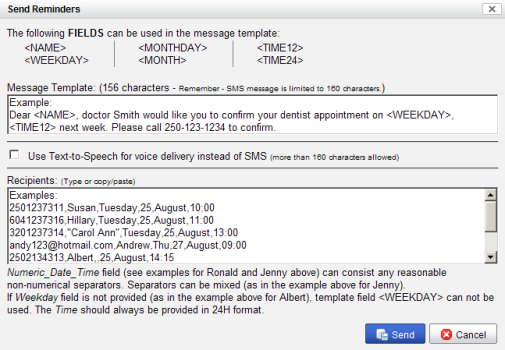 For example, if you are a dentist, you can send bulk reminders to your patients - as SMS or Voice (Text-to-Speech) messages. <TIME12> next week. Please call 250-123-1234 to confirm. Each recipient entry consists of the phone number, name and date/time of the appointment. Entries can be either manually entered, or copied and pasted from another source (e.g. data exported from dentist's own database). Data/Time can be defined in two different ways (see examples above). Numeric_Date_Time field (see examples for Ronald and Jenny above) can consist any reasonable non-numerical separators. Separators can be mixed (as in the example above for Jenny). If Weekday field is not provided (as in the example above for Albert), template field <WEEKDAY> can not be used. The Time should always be provided in 24H format. Once entered, based on the message template and the list of recipients, system will generate actual SMS or Voice (Text-to-Speech) messages, and deliver them to the recipients. SMS Messages are limited (by most carriers) to 160 characters, Voice messages have no such limit. Enterprise customers will also have direct access to their account manager, if they need to speed things up. Our support team will do their best to help you with all your issues as soon as possible. When contacting us regarding your existing account, please make sure you provide the email address associated with your account. Change Password panel can be accessed from the top menu Functions. Simply enter your current password, and your new password (twice). After you save your new password, the system will still keep you logged in. Next time you log in, use the new password. For security reasons, we recommend to keep your password safe, and avoid using simple, short or easy to guess passwords. Remember, we will never ask you for your password, either by email or by phone. Do not disclose your password to anyone.